Why did I even try? Why didn't I just settle with eating Hong Kong style siu mai (fish or pork & shrimp)? Was I mad? Yes, I think I was a little mad...I wanna blame the heat and being too tired from walking around shopping for a nice strap for my new toy. But apart from being mad, I really craved Indonesian style siomay, especially siomay Bandung, and attempted to make some, driven by pure desperation. 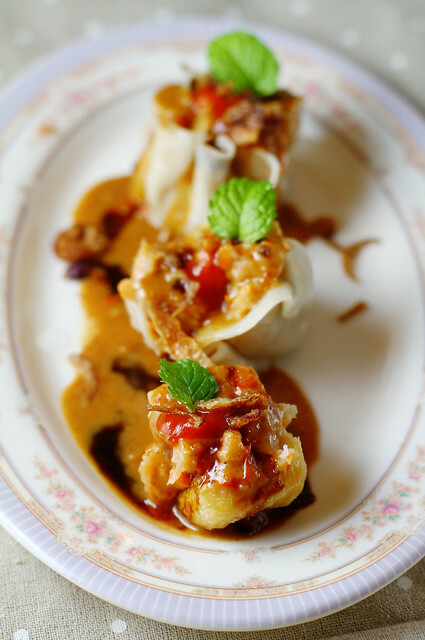 What's the difference between Indonesian siomay and Hong Kong pork & shrimp siumai you get when you go for dimsums? The Indonesian ones generally don't have chunks of shrimp meat, pork or pork fat, everything kinda blend in together and they're more...fluffy from the jicama or chayote content, plus they are generally topped with shaved carrot instead of fish roe. How about Indonesian siomay bandung vs Hong Kong fish siumai? They're both made of fish and they're both chewy, but the Indonesian ones have even less fish and garlic flavor, and they are a lot more chewy, especially the ones you get from street vendors, served with peanut sauce, chilli sauce, sweet soy sauce, crispy shallot, and a good squeeze of lime. Why am I discussing four different kinds of siomay? Which one did I end up trying to make? I was trying to make siomay bandung, but I think I ended up making regular siomay, but serving them ala siomay Bandung instead...what a frigging disaster. From recent news, I heard that most fish found in Hong Kong major supermarkets are contaminated with something, therefore, I tried to avoid fish altogether. I went with pork and shrimps instead. Since I didn't buy any jicama or chayote, I added grated carrot into the mix in my desperate attempt to make them "fluffy". Plus, since I didn't buy some wonton wrappers in the morning, I ended up trying to make my own dumpling skin from scratch...silly me. Actually it wasn't as bad as I expected...the flavors were ok...it was just pretty...dense. Not as fluffy as I wanted them to be, and the skin could really be a lot thinner. Since they are not a success, I won't share an exact recipe, I'll just describe what went into these siomay wannabes. I mixed all purpose flour, a bit of corn flour and adding water bit by bit until the dough is kneadable. I kneaded the dough until it's no longer sticky and let it rest while I prepared the siomay filling. On a lightly floured surface, I grabbed a small ball of dough (about 1.5-2cm diameter) and roll them thin, I used a rolling pin and didn't bother rolling a perfect circle, anyway they were gonna be folded. I dusted every sheet of dumpling skin with corn flour to prevent them from sticking to each other when stacking them. Once all skin's rolled, I scooped a tbsp filling and just shaped the siomay using hands, getting them ready for steaming. 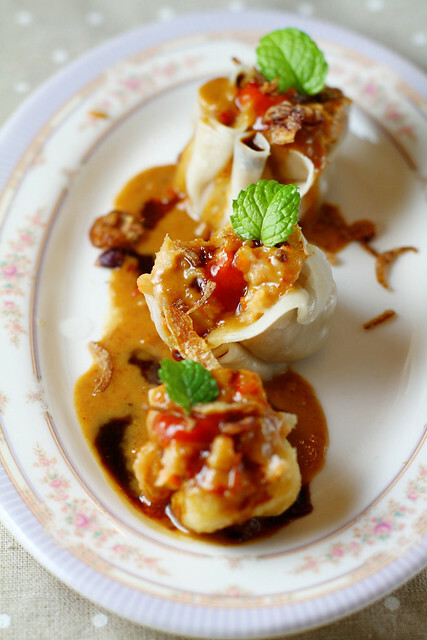 I steamed the siomay for 30 minutes, and served them ala siomay Bandung...topped with peanut sauce, kecap manis, sambal ABC, crispy shallot, and a squeeze of lemon. Not too bad...but since they were so dense, we were full only after a serving (about 4) of these. Hmm It may be because too much flour. I found if I make siomay and putting a bit more flour, it'll make the dough more dense. The recipe that I use is never adding any wheat flour. Using hagou flour is a great substitute as well. Looks good, just like those in the restaurant! Interesting, the way it's served with peanuts! But they, your siomay, look very nice. Good luck to your next try. Sad to hear those repeated news on food contaminations, good luck to us. First of all these LOOK amazing. And don't berate yourself too much for a first attempt. You gotta start somewhere! I find it interesting how you serve this siomay with all these different sauces. Oh wow, Indonesian siu mai (or "siomay", I should say)! Actually, we just made Philippine-style sio mai not too long ago! And I do prefer them over the HK-style ones. Ours also had jicama (or water chestnuts), onions and carrot in the mix... plus, we dipped them in calamansi-soy sauce. I definitely like this idea of serving them with Indonesian sauces and garnishes: sambal, peanut sauce, fried shallots?! Oh yeah. 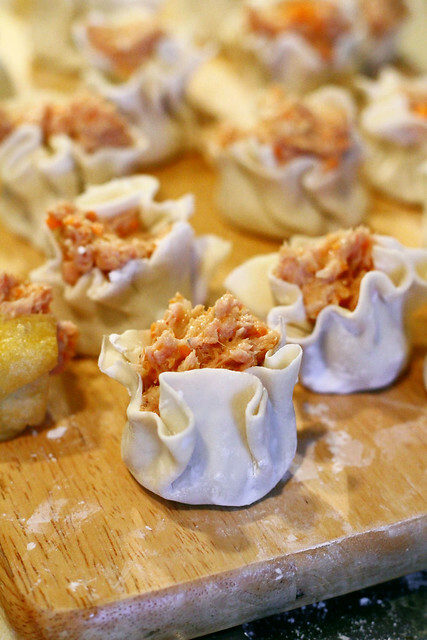 You made your own dumpling skin??! Kudos! how can u make something this neat at home?? ?